We mentioned a week ago the arrival of Russia in Mexico and its geopolitical implications. Here we give the Russian point of view through a recent interview given by Russian Foreign Minister Lavrov to the Mexican newspaper ‘ Excélsior ‘ last November. Russia formally established diplomatic relations with Mexico back in 1890. In August 1924, Mexico became the first country in the Americas to establish relations with the Soviet Union. Beside his interview with ‘Excélsior’, Minister Lavrov spoke too on this topic to RT. “Russia enjoys warm relations with Mexico including trade and high-tech investments, and even cooperation in the UN and G20. And all of this is without Moscow meddling in Mexican elections,” Russia’s foreign minister joked. Speaking to RT Espanol’s Aliana Nieves, Sergey Lavrov said “recent developments in Latin America, where some leftist governments were forced out or were defeated by right-wing parties, did not affect the region’s relations with Russia. Some countries have elections approaching, but Moscow again does not see much of a change there,” he said. 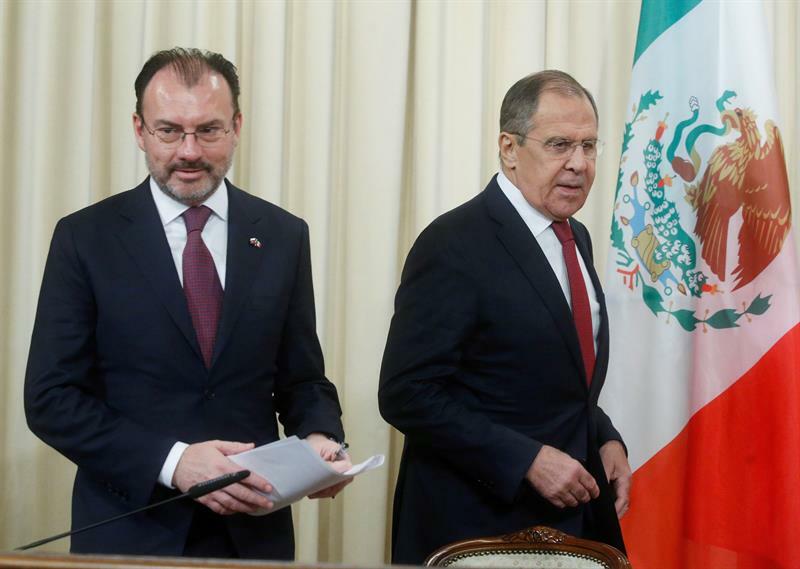 On the topic of ties with Mexico, which is set to hold general elections in 2018, Russia’s top diplomat adopted a less serious tone : “Now, as far as Mexico is concerned, again, we don’t see any ‘Russian factor’ in the Mexican elections. Nobody accuses us of meddling in this country,” he said sarcastically, referring to the array of allegations that Russia played a role in the 2016 US elections, the 2017 German elections and a number of other votes.” Taking a more serious line, he added: “We have very good plans for developing our cooperation with Mexico, including trade, investments, civil aviation and a number of other high-tech industries.” Meanwhile, Moscow has “never seen any single fact from the governments which accuse us of meddling in their internal affairs,” Lavrov stressed. Positive changes are underway in Venezuela, where the government and opposition have engaged in talks, the minister added. “If nobody intervenes in this process, I think they can work out an agreement… Some people start whispering things into the ears of the opposition, asking them, encouraging them to take a tougher stance [against the government],” according to the Russian diplomat. What is Mexico to Russia? Are there plans for more ambitious bilateral economic and political relations? What are the possibilities for signing a trade agreement in the short or medium term? Mexico is Russia’s traditional partner in Latin America and the Caribbean (LAC), relations with which go centuries back. This year we will mark two dates, the 127th anniversary of our diplomatic relations together with 20 years since the signing of the Declaration on Principles for Relations and Cooperation between our states. The consistent development of cooperation with Mexico is an integral part of our policy for strengthening interaction with the LAC countries. President of Russia Vladimir Putin and President of Mexico Enrique Peña Nieto discussed possibilities for building bilateral cooperation in various spheres during a meeting on the sidelines of the BRICS summit in Xiamen, China in September this year. Our peoples are bound together by friendship, trust and sympathy, and our humanitarian and cultural ties include numerous contacts between our citizens. Back in the early 20th century, famous Russians, including ballet dancer Anna Pavlova, poet Vladimir Mayakovsky, film director Sergey Eisenstein as well as scientist Nikolai Vavilov visited Mexico. Russian ethnographer Yury Knorozov is famous for deciphering the Maya script. Russians love works by the unique Mexican Muralists Diego Rivera, Jose Clemente Orozco and David Alfaro Siqueiros. Last year, Russian-Mexican trade amounted to $1.4 billion. We are implementing large investment and infrastructure projects. Mexico’s Interjet owns 22 Sukhoi Superjet 100 passenger liners. We have taken note of positive trends in our energy cooperation where the Russian parties are the state-owned Rosatom and the privately owned LUKOIL. We welcome the energetic work of our Mexican partners in Russia. In particular, Nemak opened an automobile components plant in the Ulyanovsk Region in September 2015, and Gruma International Food launched production in Russia in September 2017. Of course, our trade and investment ties have much more potential. The Russia-Mexico Mixed Commission on Economic, Commercial, Scientific-Technical Cooperation and Marine Navigation is contributing to their development. There are good cooperation prospects in aircraft manufacturing, shipbuilding, chemicals and pharmaceuticals, marine equipment, power generation, automobile manufacturing, railway equipment and agriculture. Dialogue between our business quarters is very important. We would like Mexican representatives to be more active at the St Petersburg International Economic Forum, the Eastern Economic Forum in Vladivostok, the International Forum of Technological Development in Novosibirsk, the INNOPROM International Industrial Fair in Yekaterinburg, as well as the Russian Energy Week. In October, Industry and Trade Minister Denis Manturov together with representatives from over 50 Russian companies attended the Mexican Business Summit in San Luis Potosi. We hope the contacts they have established there will produce practical results soon. Work is ongoing on a long-term programme of trade, economic, scientific and technical cooperation. The draft of this programme has been forwarded to our Mexican partners for coordination. We hope to be able to sign this document in the near future. It is also obvious that broader business interaction can facilitate the signing of a visa free travel agreement in the interests of our people. Russia and Mexico are actively cooperating on the international stage, including at the UN, the G20, APEC plus other international venues. We have been working consistently to promote international relations that are based on international law, non-interference in the internal affairs of sovereign states, as well as the exclusively political and diplomatic solution to crises and conflicts. I hope that the upcoming visit to Russia by Foreign Secretary Luis Videgaray Caso between November 16-17 will help strengthen the multifaceted Russian-Mexican relations. Mexico and Russia are both in the sights of Washington now, and both countries’ diplomatic relations with the United States have become strained. Can this be described as an opportunity to strengthen relations between Mexico and Russia? Relations with any country are valuable to us, per se. We develop them regardless of changes in the political situation. This is fully applicable to our cooperation with Mexico. We hope that long-term Russian-Mexican ties will continue to develop on the basis of equality, mutual benefit and respect for each other’s interests. No matter what relations either country may have with the United States, Russia is always open to cooperation with Mexico on the above principles. Are Mexican elections of interest to Russia? Does it matter to you who will assume the presidential office in Mexico next year? We are interested in strengthening cooperation with Mexico as an active and independent international player. We note with satisfaction that a strengthening of Russian-Mexican ties enjoys broad support among the Mexican public and in the country’s political circles. We hope to preserve and increase the accumulated capital of our fruitful partnership through concerted efforts. As for elections, they are an internal affair for Mexico. We will develop relations with any elected president. This brings to mind a quote from your great political and state leader, the national hero of Mexico, Benito Juarez, who said: “The principle of non-intervention is one of the first obligations of governments; it boils down to respect for the freedom of peoples and for the rights of nations.” (El principio de no intervencion es una de las primeras obligaciones de los gobiernos, es el respeto debido a la libertad de los pueblos у a los derechos de las naciones). Russia has always been committed to this principle.